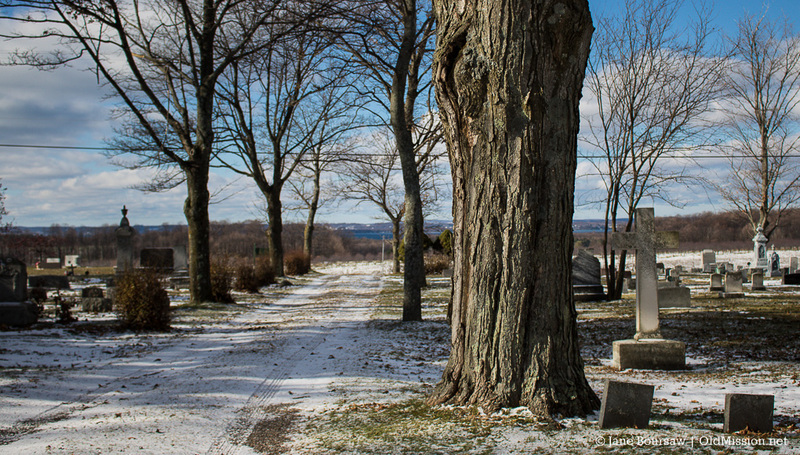 I like to check in with the Old Mission Peninsula elders regularly, so today’s Photo of the Day is of the Ogdensburg Cemetery, just north of the Old Mission Peninsula United Methodist Church (my home church in which I grew up and still attend). This is near the top of the cemetery near Center Road. So you’re looking west and can see West Bay off in the distance, past Freddie Dohm’s farm and my brother Ward Johnson’s farm. Some of the names gracing the headstones in this area of the cemetery include Steffes, Eiman, Chapman, Field, Helferich, Tompkins, Ghering, Dohm, and my own family, Johnson and Edgecomb. My dad, Walter Johnson, is buried in this part of the cemetery, as well as my grandma (his mom), Stella Johnson, and her first husband, Frank Edgecomb. When my mom, Mary Johnson, passes, she will also be buried here, next to my dad. Her name is already on the headstone next to his. I’ve never viewed cemeteries as places to avoid. On the contrary, I love wandering through this cemetery, in particular, because I know most of the people buried here. It’s like visiting old friends you’ve known all your life – comforting and peaceful.